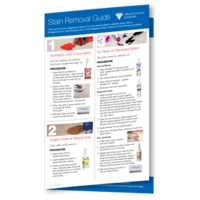 Order this easy-to-follow cleaning guide for each of your techs. They will have the cleaning formulas and techniques in their own truck. This guide is included in the Bridgepoint Spotting Kit. Printed on heavy-duty card stock and UV coated for durability and protection. Download a free copy below.